BASIX is the NSW minimum standard for buildings in terms of water, thermal comfort and energy efficiency. 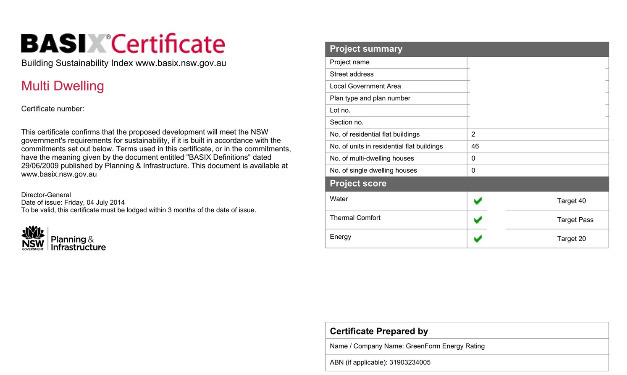 A BASIX Certificate forms part of the documentation required for building and development submissions to council. BASIX Certificates are submitted at the DA stage for project approvals and are also required at CC and final inspection stages. This applies to Shellharbour, Wollongong, Sydney and all NSW areas, and for all types of Residential developments including new homes, dual occupancies, multi-dwelling units and apartment projects. We can help with; BASIX Certificates for single dwellings, multi-dwelling projects, granny flats and renovations. NSW: We recommend using NatHERS for the thermal section of BASIX to reduce the construction costs of complying with BASIX alone & increase building design flexibility. – You are installing a swimming pool/spa with a capacity of 40,000 Ltrs or more. BASIX Certificates are generated online using the website owned and maintained by the NSW Government, Department of Planning and Infrastructure. We have worked on many types of developments and building projects using the BASIX assessment program. We also offer use of the “Simulation Method” (NatHERS) for input into BASIX where required or where beneficial. GreenForm is experienced with BASIX and we can help you meet compliance with the most practical and cost effective solutions. To find out more contact us today.